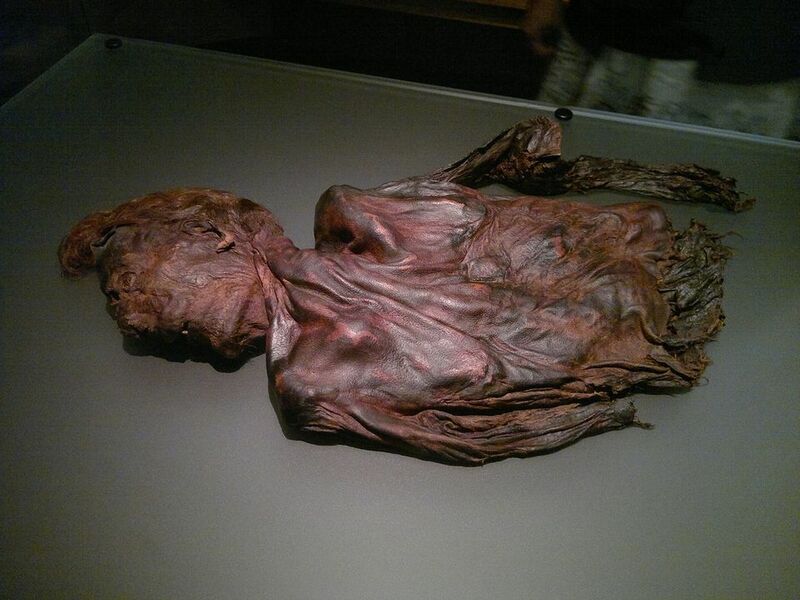 Clonycavan Man is the moniker under which a well-preserved bog body found in Clonycavan (County Meath) is known, the partial torso, arms, and (most important) complete head are now on display in the National Museum of Ireland. What is left of him is in a good general level of preservation, though flattened. He was found in a modern peat harvesting machine, meaning the lower part of his body was more than likely shredded and used as fuel. When the find became known in 2003, Ireland's police force, the Garda Siochana, immediately swooped in. You might wonder why, as bog bodies from ages ago are not exactly unknown. On the other hand, the disposal of victims of violent crimes in Ireland's bogs is not exactly unknown either. Even a shallow grave will suffice, as in the middle of nowhere no-one can smell you decomposing. And then there is the problem of Ireland's "Disappeared". Paramilitaries (like the IRA) developed the terror tactic of making persons simply disappear without a trace. Nearly twenty men and women fell victim to (presumed) abduction and murder. Some are still missing today, with several recent finds in boglands, making a police investigation into any remains dug up in the bogs a high priority. Gardai investigating the body indeed concluded that Clonycavan Man had been murdered. His skull was split open by a sharp implement, leading to a deep wound in the top of his head and catastrophic brain damage. Through radiocarbon dating his death was, however, placed roughly between 392 BCE and 201 BCE - hence no witnesses and suspects were sought. The remains found at Clonycavan are by no means the most spectacular bog body you may imagine. There are better examples, and with half the body missing, the murder victim was not exactly a prime example. But Clonycavan Man quickly became somewhat iconic through a fashion statement - a Mohawk-like hairstyle, raised with the help of plant oil and pine resin, a styling gel more than likely imported from southwestern France or Spain. This early, primitive and effective hair gel (the styling kept 2,300 years, after all) points toward Clonycavan Man being wealthy. Otherwise, who could afford such luxury? Was the hairstyle normal? Maybe, maybe not, we simply do not know enough about the specific period of history to make a decision here. It has been said, though, that the bouffant hairdo might have been an attempt at compensation. After all, Clonycavan Man only would have been around only five feet two inches in height (not exactly the tallest tree in the forest). Why Was Clonycavan Man Killed? In the absence of any concrete evidence, we have to speculate a bit, and draw inspiration from what we know about the Irish and Celtic world at the time. And that points us towards a theory of his death not being cold-blooded murder, but a (possibly) religious ceremony. The main indicator of this being the actual manner of Clonycavan Man's demise - this was not drive-by bludgeoning with a teenager high on fly agaric taking a random victim from his chariot. Far from it: the victim was hit no less than times on the head, also once in the chest, and received another blow to the nose. All injuries may have been caused by the same weapon. After he was dead (one hopes at least), Clonycavan Man was also disemboweled and his innards removed. Then the body was buried in the bog, which was often a sign for a ceremony. From this evidence, it has been widely suggested that Clonycavan Man was the local nobleman, ritually (and presumably more or less willingly) sacrificed to ensure prosperity for his tribe. As he was in his early twenties, he would have been a prime sacrifice. Then again, he could have been mugged by somebody with an eye on his hair gel - well, not really (as the death is too elaborate for a mugging), but other theories certainly cannot be discounted. Clonycavan Man will keep silent about all this, but he might also have been a rival chieftain put to death by an extremely annoyed tribe. Or a nobleman who simply broke the law once too many, and was executed for this.